One of shotgunning’s most underutilized live resources is the pest pigeon population. Generally pest pigeon shooting here in the USA has little resemblance to the woodpigeon shooting that is so popular in the British Isles. In England woodpigeons are usually decoyed, and you hire a guide who has the birds scouted, the land owner’s permission to hunt, and all the equipment so that clients can enjoy great sport. Here in the USA, pigeons are more associated with farm buildings than they are with farm fields. Consequently, decoys are super-effective only when a particular feed field is where the birds want to be anyway. 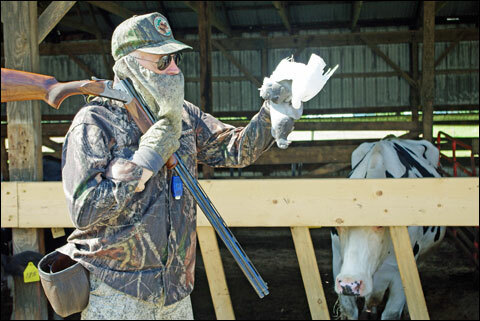 If you’ve played your pest pigeon-shooting cards correctly at a pigeon-infested dairy cow or beef cattle farm you are already positioned exactly where those birds want to be, and that is around the farm buildings. 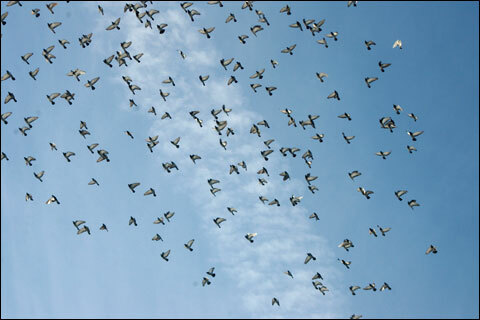 Pest pigeons gravitate to farms that offer an unending food source. Find the right situation with that food source and you might find shooting at literally hundreds of birds. One prime spot would be a feed lot for beef cattle, and the more cattle being fed the better. I hunt a few farms where beef cattle are the farmer’s figurative bread and butter, but where I tend to find the most pigeons in my area is at dairy farms. Typical feeding situation at a modern dairy barn. The silage is put just outside the open-air barn on cement. The cows stick their head outside to feed. Pest pigeons can land and feed right with the cows. Let me explain the dairy farm situation that I typically look for. Today’s most modern dairy barn has little similarity to the dairy barns of yesteryear. Yes, there are still big red barns, and some of them hold pigeons, but the modern dairy barn is a one-story affair, and usually that barn is open on all sides. 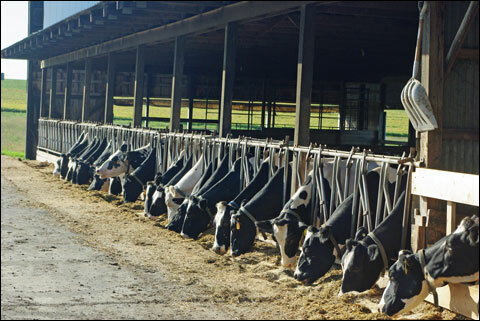 To feed, the dairy cow sticks her head/neck outside between individual stalls so that these cows actually feed on silage that is dumped on cement via a front-end loader or other farm equipment that can put a lot of feed out in a short period of time. As you might have already guessed, pest pigeons have easy access to this silage because that food is outside – on the cement. So the birds fly right in – feed right where the dairy cows are feeding. They seldom fly away to relieve themselves – so they do their business right on the silage that the dairy cows are feeding on. Dairy farmers who have these open-air barns who feed their cows outside – when flocks of pest pigeons come to forage – learn to despise them. Consequently, I am almost always welcomed to shoot these pigeons. I shoot in full camo garb including camo gloves and camo face mask, but other than my camo pants I leave the camo in the car when I stop to ask permission to shoot at one of these places. To help insure that the farmer says, “Yes,” I suggest wearing a necktie – yes a necktie. Actually, wearing a necktie when seeking permission to hunt anyone’s land is a great thing to do. The necktie sets you apart, shows the land owner that you have a little class. As you can see from the surroundings, Sisley’s pest pigeon shooting is done right at the silos and other farm buildings. Since I’m not out in the farmer’s field shooting, he knows I will be shooting around his barn and silos. Pigeons love to use the tops of silos when they are not down with the cows and gorging themselves on the farmer’s silage. So I stress to the farmer that I’ve shot thousands of pigeons, have never had an accident or even an issue, that I will pick up all my empty shells and be very careful where I shoot and never jeopardize anyone or any animal. Such emphasis is even more important than the necktie. I always pass up a lot of shots in these farm building situations. Just one reason is that overhead electrical wires seem to be everywhere. Also I have one farm where I can only shoot in one direction. Here my pull-the-trigger zone is only about 70 degrees of the compass. Assuming 360 degrees would be the full circle, that means I cannot shoot in 290 degrees of the imaginary compass. When they are not feeding pigeons head for adjacent silos. Their droppings don’t do the silo metal roofs any good either. Because I have promised to pick up all my empties I prefer to shoot a double gun for pest pigeons. In fact, most of the time I shoot a competition-type over and under. My point: don’t leave your sporting clays shotgun at home as such a competition gun will be ideal for pest pigeon shooting. Reasons? Hopefully, you will be getting a lot of shooting, and plenty of shooting bodes well for a heavier competition O/U because of such a gun’s recoil absorbing qualities. Further, added shotgun weight and longer barrels pay off when shooting these birds – just as such shotguns pay off in shooting doves. A pest pigeon shoot has nothing in common with say ruffed grouse, woodcock and bobwhite quail gunning. Two of my 12-gauge favorite pest pigeon guns are (1) a Krieghoff model 32 with 30-inch barrels and (2) a Perazzi MX-8 with 28½-inch barrels. Obviously a longer-barreled Perazzi might be even more preferable, but I don’t have one. I shoot reloads almost exclusively in these guns, preferably using the Federal paper case as long as I can find them – which I fill with one ounce of shot and keep the velocity down to around 1130 – 1150 feet per second. Now it’s out – for you know what a recoil pussycat I am. The thing about one-ounce loads at this somewhat lower velocity is that they pattern so beautifully. With few exceptions I choke up with both 12-gauge barrels at .005-inch constriction, although I do have screw chokes for both these guns. When pigeon flocks grow to this size you can bet farmers detest them. But I shoot a 28 gauge as often on pest pigeons as I do the 12 bore. The one I’ve shot the most is a 28-gauge Caesar Guerini Summit Sporting with 32-inch barrels. While I sometimes shoot open chokes for pigeons in that gun I do tend to choke up tightly most of the time – Full and Improved Modified – often shooting the Full barrel first. My latest 28-gauge acquisition is a “bring back” of an old Browning model. Guns Unlimited in Omaha, Nebraska did the “bringing back,” so that’s the only place you will find this one. In 1989 Browning brought out the Citori Special Sporting Clays Edition. It had a slightly higher rib than the other Citori sporting guns, so it was maybe ahead of its time in `89 since there are so many super high rib guns today. Guns Unlimited had Browning make up 900 of these Special Sporting Clays Edition Citori O/U – and in all four gauges – and in two barrel lengths – 30 and 32 inches. I went for the 32-incher. An adjustable comb stock was an option, and I went for that one. Both of these 28-gauge competition guns weigh just a bit over 7 pounds while the 12 gauge guns already covered go well over 8 pounds. Usually I stick with 28-gauge reloads, most often in the Remington STS case – only ¾ of an ounce – velocity relatively low at around 1140 feet per second. Put that 28-gauge pattern where the pigeon is and these birds come tumbling down. With the open-air barn and dairy cows in the background Sisley poses with one of the fallen. The competition over and under on his shoulder is a Caesar Guerini Summit Sporting – a 28 gauge with 32-inch barrels. 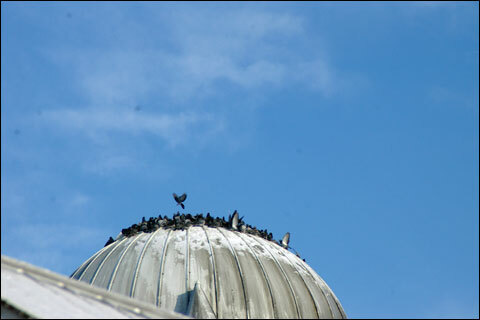 Typically, pest pigeons start showing up in big flocks in late summer – say early to mid-August. They maintain this big-flock status through until about the end of February. That’s when the birds start pairing off to nest and have their young. I’m told pigeons only have two eggs per nest, but I’m betting mature pigeon females will re-nest at least once, maybe twice. 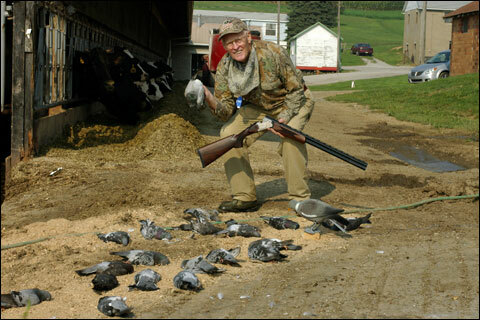 One day I shot 90 pigeons, could have shot more, but I ran out of shells, so this shotgunning can be very, very good. Further, that was not the best pigeon day I’ve ever had. Interestingly, I was reluctant to ask that farmer for permission to hunt because right across the road from his barn is a bank. Almost next to the bank is the local magistrate’s office building. Across from both the latter is a shopping center with a huge chain grocery store. When I asked permission the day before I wanted to shoot, farmer Frank said, “You mean you’re willing to shoot these pigeons?” I don’t know how much my necktie had to do with him being so anxious to have me shoot those pest birds, but he was obviously fed up with them. I replied no that it was OK – I just wanted to shoot the birds for him. Again I replied no, but I tell you this truthful story to hopefully give you an idea how badly many farmers want rid of pest pigeons. As always, check local regulations. Nick Sisley welcomes your emails at nicksisley@hotmail.com. Sisley has been writing full time for 43 years, his thousands of articles appearing in many, many magazines. He’s the author of eight books, is an NSCA, NSSA and NRA Shotgun Instructor and a pilot with many ratings.